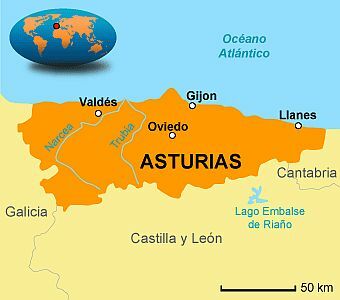 In the autonomous community of Asturias, in northern Spain, the climate is cool and damp, and strongly influenced by the Atlantic Ocean. Winters are relatively mild and rainy, while summers are cool and fairly sunny. Atlantic frontal systems can affect this area all year round, although they are rarer in summer, when, however, thunderstorms can break out in the afternoon or in the evening. The wind blows frequently, so there are several beaches frequented by surfers. Fog is also common: it can show up all year round, when there is no wind, and even on summer nights, especially along the coast and in the valleys. In winter, cold air masses from northern Atlantic Ocean and continental Europe can lead to cold and windy periods, but very cold days are rare on the coast (the cold records are a few degrees below freezing). However, even on mild days the wind can increase the feeling of cold. 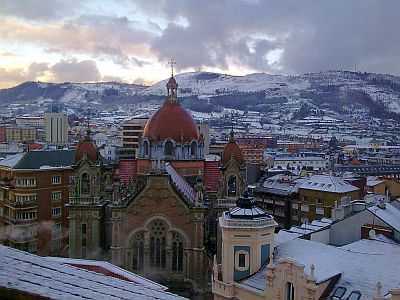 Snow, very rare on the coast, is a bit more frequent in inland hilly areas, for example in Oviedo, which is located at 340 meters (1,100 feet) above sea level. On the contrary, in the mountains, snowfalls can be abundant. The rains are quite abundant, in fact they hover around 1,000 millimeters (40 inches) per year on the coast and in hilly areas, and are frequent, especially from October to May, while in summer their frequency diminishes a bit. Owing to the abundance and frequency of rain, the landscape is green. In the interior, we find hills, and in the southern part of a mountain range, the Cantabrian Mountains, which separate this cool and moist part of Spain from the arid central plateau (called Meseta); in particular, in the southeast stand out the Picos de Europa ("Peaks of Europe"), whose highest peak is Torrecerredo, 2,648 meters (8,689 feet) high; these mountains receive heavy snowfalls in winter. There are also skilifts. Around a thousand meters (3,300 feet) of altitude, we find the lakes Enol and Ercina (also called Lakes of Covadonga). In mountainous areas, there are parks, such as Parque Natural de las Ubiñas - La Mesa, Parque Natural de Somiedo, and Parque Natural de Redes. The wind that comes down from the mountains may cause rapid increases in temperature due to the föhn effect: in these cases, along the coast the temperature may exceed 20 °C (68 °F) in winter and 30 °C (86 °F) in autumn and spring, while in summer this hot wind is very rare. Here are the average temperatures of Gijon, the largest city, located on the coast. In Gijón, 955 mm (37.5 in) of rain fall per year, with a maximum in autumn and a relative minimum in summer, when, however, there's no lack of rainy days. The sea along the coast of Asturias is a bit cold even in summer, since it reaches 19 °C (66 °F) in July and 20 °C (68 °F) in August, as you can see in the following table, on the sea temperature near Gijon. On the coast of Asturias, or Green Coast, rugged and characterized by coves and natural caves, there are several beaches and resorts such as Cabo de Peñas, Luarca, Luanco, Aviles, Gijón, Cudillero, Llanes and Ribadesella. In the capital, Oviedo, which as mentioned is located at 340 meters (1,100 feet) above sea level, the temperatures are similar to those of Gijón, although they are a bit lower at night and in winter. In Oviedo 1,005 mm (40 in) of rain fall per year; summer is the least rainy season, but it rains 8/9 days per month also from June to August (or in September, when the weather is somewhat similar). The amount of sunshine in Asturias is not very good: in July and August there are 5.5/6 hours of sunshine per day in cities like Avilés, Oviedo and Gijón; in the other seasons, and especially in late autumn and winter, it is even worse, and the sky is often cloudy. Here are the average daily sunshine hours in Oviedo. 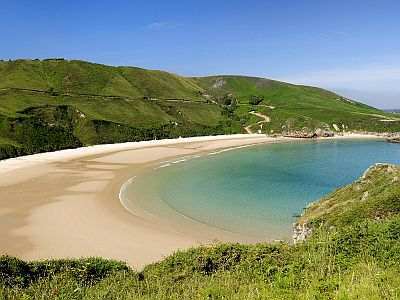 The best period to visit Asturias is the summer, from June to August or the first half of September, since it is the driest and sunniest time of the year. July and August are the warmest and least rainy months. Even in midsummer, we must take into account some rain, and some nights a bit cool on the coast, and a bit cold in inland areas. In summer, in good weather you can have a break at the beach and sunbathe, with an air temperature often pleasant and a cool breeze from the ocean, although as I said the sea is cold for swimming.